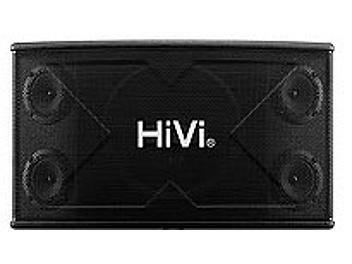 The KX1000 speaker is designed as a professional loudspeaker using HiVi's extensive experience in high fidelity loudspeaker design. The speaker system is a two way bass reflex design equipped with a 10" woofer and four 3" tweeters. The speaker is designed specifically for club and karaoke use and uses paper cone professional drivers that are optimized at reproducing music and human voice. Drivers are extremely resistant to fatigue and can be played at high power levels for prolonged periods without damage. Human voice is soft and smooth, bass is powerful and dynamic. Each driver works without it's optimal frequency band and is crossed over using high-precision components. Durable cabinets are finished in wear resistant speckled black paint to prevent scratching or damage. Drivers are protected with black steel grilles that offer minimal resonance. Each speaker features a specially designed universal mounting system for simple and easy installation.